The International Space Station orbits toward the sun to experience one of the 16 sunrises the crew has every day. 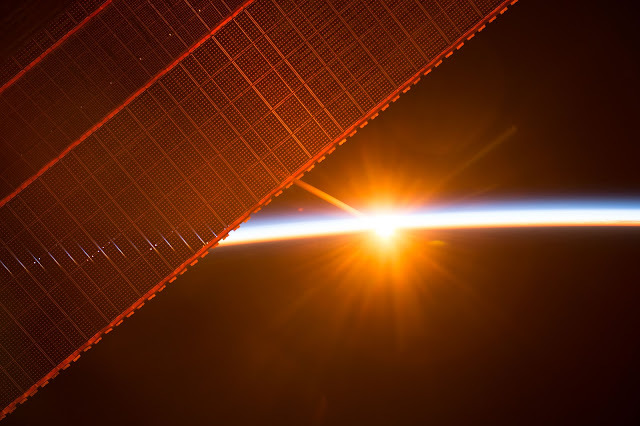 | July 31, 2017: On July 26, 2017, a member of the Expedition 52 crew aboard the International Space Station took this photograph of one of the 16 sunrises they experience every day, as the orbiting laboratory travels around Earth. One of the solar panels that provides power to the station is seen in the upper left. The station's solar arrays produce more power than it needs at one time for station systems and experiments. When the station is in sunlight, about 60 percent of the electricity that the solar arrays generate is used to charge the station's batteries. The batteries power the station when it is not in the Sun.